A very special thing happens every four or so years. This special thing is so special that following its specialness the world as we know it cannot ever be the same. We know presidents come and go and olympians win medals but if we are really lucky every four or so years Arjen Lucassen releases a brand new Ayreon album. This time around we are introduced to The Source and it is arguably one of his best works yet. For those who are unfamiliar with the Ayreon universe let me break it down quickly, Ayreon albums are sci-fi rock/metal operas featuring a diverse mix of the best and most distinctive singers in the world. For those familiar with Ayreon, The Source delivers on every aspect you come to expect from an Ayreon album to the highest degree. Firstly, the storyline is a return to the Forever storyline which spans the majority of the Ayreon albums. Without spoiling the fun of watching the story play out, we witness a world living with their decision to become solely reliant on their technology which brings forth a self-induced apocalypse. We then continue to watch their struggle to find a way to escape total extinction. The album is full of songs that express the vulnerability of regret and panic a people would feel facing their downfall as well as the optimism and hope of finding a potential future. Now, the foundation of an Ayreon album is the music and The Source is about as Ayreon as it gets. As always the drumming is perfectly executed by that of Ed Warby (Elegy, Gorefest, Hail of Bullets). As always there are unreal guest musicians, this time this includes Paul Gilbert (Mr. Big, Racer-x) Guthrie Govan (The Aristocrats, Steven Wilson), Marcel Coenen (Sun Caged) and Mark Kelly (Marillion). The songs are as musically varied as you’d expect from an Ayreon release. Each song creates a particular atmosphere that even without the vocals it would be clear a story was being told. I is clearly a guitar driven album with some of the heaviest and catchiest Ayreon riffs to date. The riffs are as always interweaved with the flutes, strings and ultra prog synths that create the signature Ayreon sound. At the same time while sounding undeniably Ayreon there are some clear nods to classics such as Queen and Deep Purple. It would be basically impossible to express the quality of the vocals on The Source through individual examples due to the countless perfect performances on the album. The most impressive aspect regarding the vocal performances is the personalities that shine through with each singer. Each vocal performance is incredible not only in the ability of the singer to deliver a melodic line but to further the story and interact with each other. As each voice is introduced their personality is immediately apparent, the counselor feels comforting, TH-1 feels inhuman, the captain feels cocky and so on. 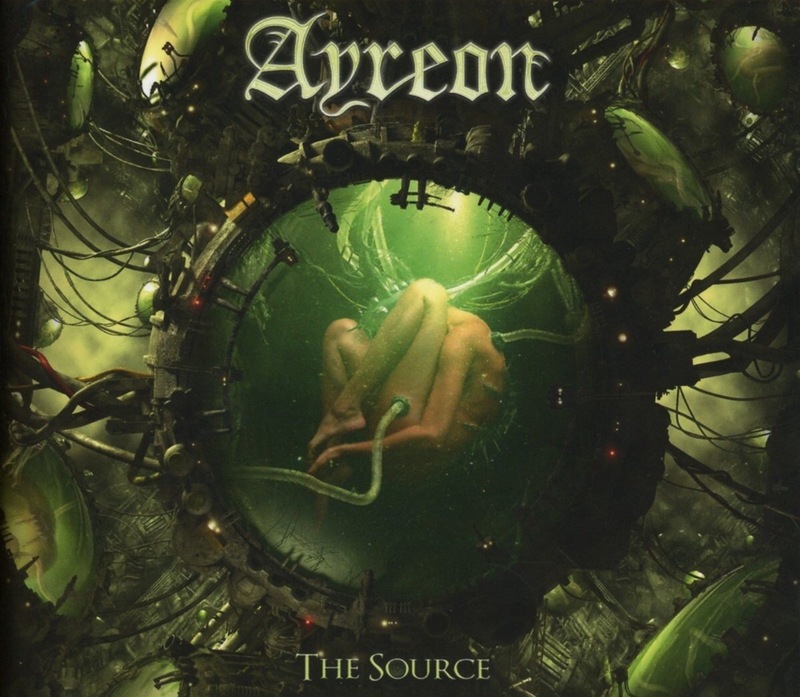 There are a number of Ayreon alumni on “The Source” including Floor Jansen (Nightwish, After Forever), James Labrie (Dream Theater), Simone Simons (Epica), Mike Mills (Toehider), Tommy Karevik (Seventh Wonder, Kamelot), Hansi Kursch (Blind Guardian), Russell Allen (Symphony X) as well as new blood including Tommy Giles Rogers (Between the Buried and Me), Michael Eriksen (Circus Maximus), Nils K. Rue (Pagan’s Mind), Zaher Zorgati (Myrath) and Tobias Sammet (Edguy, Avantasia). I suggest just pausing and taking a moment to come to terms with the fact that an album exists with that cast of singers. The ability that Mr. Lucassen has in bringing distinctive and diverse voices together is unbeatable. I cannot imagine any other songwriter would put out an album with the vocalist of Edguy and the vocalist from Between the Buried and Me and be able to write so perfectly for both of their voices. Albums very rarely live up to the hype and generally fall short of their classic predecessors, The Source easily surpasses the hype. If you are a long time fan The Source is every bit as strong as your favorite Ayreon album. If you are new to Ayreon this album is a perfect kick off point. There is not a moment on the album that doesn’t feel purposeful, not a song that is skipable or a voice that falls short of the others. The Source feels as though it is coming from a very focused and rejuvenated Arjen Lucassen and I for one am excited to play it consistently for the next four years.